What is steel can recycling association? 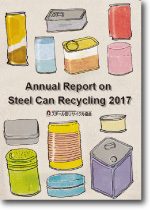 ｜ JAPAN STEEL CAN RECYCLING ASSOCIATION. What is steel can recycling association? can manufacturers and steel distributing companies. The aim of the association is to promote the recycling of steel cans. *Please click here about the Annual Report 2016. *Please click here about the Annual Report 2015. *Please click here about the Annual Report 2014. *Please click here about the Annual Report 2013. *Please click here about the Annual Report 2012. *Please click here about the Annual Report 2011. *Please click here about the Annual Report 2010. *Please click here about the Annual Report 2009. *Please click here about the Annual Report 2008. *Please click here about the Annual Report 2007. Survey on Cooperative Group Collection. 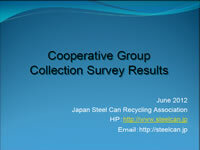 Japan Steel Can Recycling Association conducted the survey on the cooperative group collection from 2005 through 2009. The survey results are as follows. *Please click here about the survey results on Cooperative Group Collection.